Since my first Blu-Ray I owned, a present from the wonderful JC, was Toy Story I saw that Disney has an “Upgrade to Blu” program. 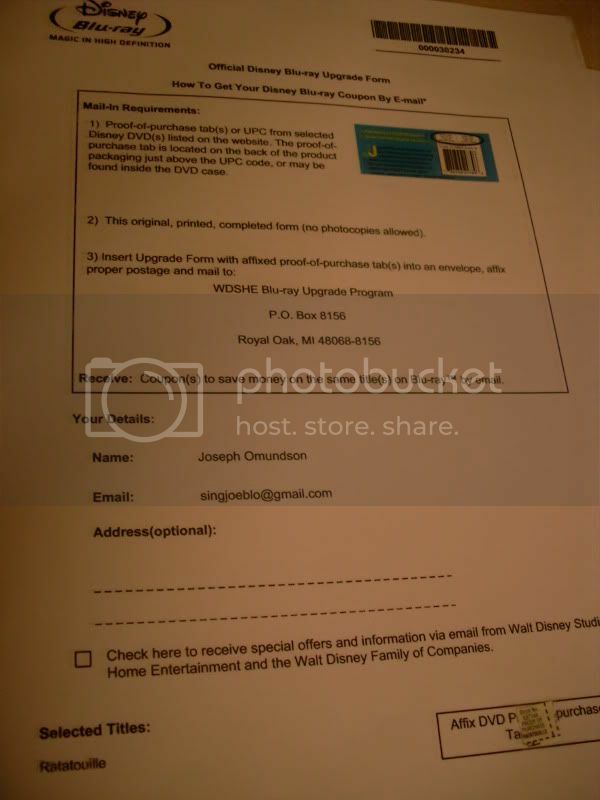 If you own a Disney DVD you can fill out a form, attach some proof of purchases and you will get an $8 coupon for that movie. $8 isn’t a ton, but it would be nice to add that to a sale of some sort so I went to their site and selected the movies I owned and am going to mail off my form. The first thing I noticed is that not every Disney DVD is listed. Even the ones I KNOW that have Blu-Ray’s out. I own all three of the Pirates of the Caribbean movies and think that they would be even better in Blu, but they aren’t offering a coupon for the Johnny Depp movies! Has anyone else tried this program? It supposedly is only for this year and I may not use the coupons I get (Ratatouille, WALL-E, and Up) but at least I will have them in case I want to upgrade. Also, if I upgrade I will either EBay or MovieStop the DVDs for a little extra cash!